Styles help you create a consistent look on your pages. If you’re used to applying styles to text in Word, you'll be happy to know you can do the same thing in OneNote. Select the text you want to change to a new style. On the Home tab, click the drop-down arrow under Styles and choose a style. Tip: You can change several portions of text to the same style at the same time. Hold down the Ctrl key as you select each group of text you want to change. If you want to apply the same style to the whole page, press Ctrl+A, and then choose a style. Choose Clear Formatting to revert to the default style. 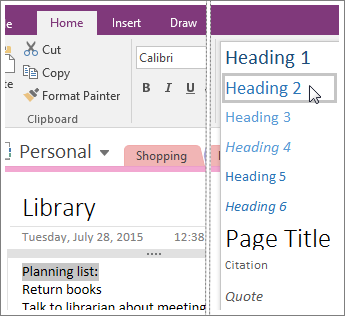 OneNote has a limited number of basic styles but you can create your own styles and use Format Painter to apply a style to other portions of text.